Villa Fah Sai is a vacation rental that stands out from the rest. The palatial abode has earned a spot in notable publications such as The New York Times, and for good reason - it occupies a prime seafront location, offers uninterrupted views over the Andaman Sea and Patong Bay and features drool-worthy interiors that combine modern design with classic Thai elements. Containing five beautifully appointed bedrooms, along with generously proportioned indoor and outdoor living spaces, Villa Fah Sai is ideally kitted out for travelling parties of up to 10. 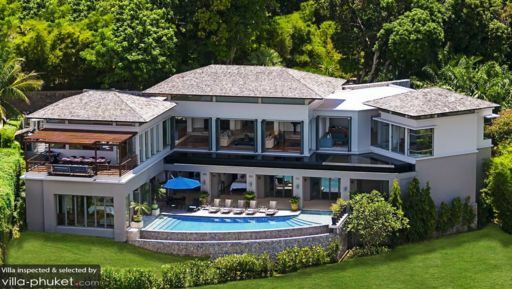 The property contains five bedrooms, all of which feature ocean views and en suite bathrooms. The lavishly furnished master suite deserves a special mention: it spread out over 1,500 square feet, and comes complete with amenities like a walk-in closet, private living area and office space. Enjoy views out to Patong Bay and the Andaman Sea when you take a dip in the villa’s freshwater infinity pool (there’s a indoor tub for guests who prefer enjoying a soak without having to step outdoors). Done with your swim? Dry off as you lay upon one of the poolside loungers. On balmy evenings, round up your friends and family for an alfresco meal out on the terrace. It’s outfitted with a 10-seater dining set and lounge furnishings, so you’ll have the perfect setup for sunset cocktails and a dinner party. The living spaces at Villa Fah Sai are plush and inviting, featuring contemporary furnishings, wooden fittings and neutral hues complemented by bright pops of colours. The main living area is capacious and lofty; it contains a lounge, dining area and gourmet kitchen. Open out the bi-folding doors to create a breezy indoor-outdoor space with panoramic views out to the villa’s postcard-perfect surroundings. There’s also a games room equipped with Xbox 360 game console, a card table and treadmill. Airport transfers, a daily breakfast service, personal guest service and the usage of a baby cot are provided with your stay. Amenities available at additional cost include personal chef service, laundry service, in-villa massages, car rental and child minding services. 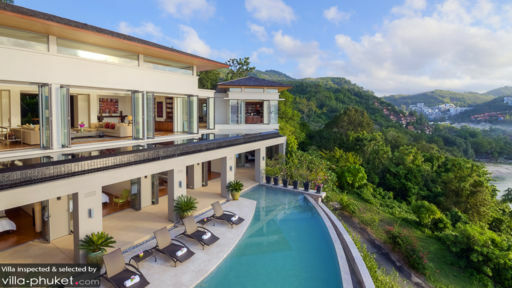 Villa Fah Sai is located in Kamala, West Phuket. 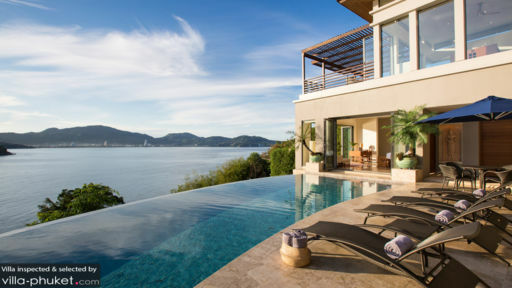 As part of the Samsara Estate, the villa enjoys a private, tucked-away setting on a headland about 200 feet above sea level. From your villa, you’re about 10 to 20 minutes’ walk down to the beaches in the surrounding vicinity, and about a 10-minute drive to Kamala Beach. Kamala is known for its vibrant atmosphere, family-friendly setting and diverse lifestyle and dining venues. Away from the beach, villa vacationers may take in the sights and sounds of the bustling Kamala Night Market, take the kids for a day out at Phuket FantaSea or enjoy wellness treatments - from massages to yoga classes and reiki sessions - at venues like Spa by Paresa. Planning a day trip? Don’t miss out on a visit to the Big Buddha; it’s the island’s landmark attraction, and is well-known for its striking 45-metre white marble statue of the Buddha. The attraction is about an hour’s drive from your villa, but it’s easy to plan your trip such that you stop by other notable attractions along the way. These include Wat Chalong, Khao Rang Viewpoint and Phuket Old Town. Kamala offers a varied dining scene, which ranges from French bakeries and cosy bistros, to stylish beach clubs and upscale establishments. Places that come with our recommendations include HQ Beach Lounge, Lafayette French Bakery, Vanilla Sky Bar & Gastro Pub, Ambassador Bistro and Old Siam Authentic Thai Restaurant. These venues are located about five to 10 minutes’ drive from your villa.